There are lots of ways to get here . . .
. . . drop us a line if you are unsure of the best route! Gourdon lies 20km west of Junction 56 on the A20 (main Paris-Toulouse motorway). For Channel crossings have a look at Eurotunnel or Ferry Savers and to plan your itinerary try ViaMichelin. Ample free parking is available in the nearby streets and squares of Gourdon. Getting to Gourdon by train is very easy. Gourdon is on the main train line running north-south between Paris and Toulouse, so normally you don't have to change trains. The Paris station for trains to Gourdon is Gare d'Austerlitz. If you're coming from Bordeaux or Bergerac, it is possible to take a train to Sarlat. For car hire, Europ Car Sarlat is five minutes' walk from the station. The drive to Gourdon takes 30 minutes. Alternatively, taxis are available in front of the station to take you to Gourdon. We have always found the SNCF Web Site very handy for organizing train travel. When you search for trains to Gourdon, make sure you select "Gourdon - Occitanie". You can buy your tickets online with a credit card. You can then either print off etickets or pick up normal tickets from a ticket machine at the station using the same credit card. Bergerac-Roumanière Airport is located 3km from the city centre. There is car hire available at the airport. The drive to Gourdon takes around 1 hour 30 minutes. Alternatively, there are taxis (bookable in advance) from the airport to Bergerac train station for trains to Sarlat (see information on trains above). Bordeaux-Mérignac Airport is located 12km from the city centre. There is car hire available at the airport. The drive to Gourdon takes around 2 hours 45 minutes. Alternatively, there are taxis (bookable in advance) from the airport to Bordeaux Saint-Jean (the main train station) for trains to Sarlat (see information on trains above). Brive-Souillac Airport is located 13km from the city centre. There is car hire available at the airport. The drive to Gourdon takes around 45 minutes. Alternatively, taxis are available in front of the airport for each arrival to take you to Brive train station for trains to Gourdon. Limoges-Bellegarde Airport is located 6km from the city centre. There is car hire available at the airport. The drive to Gourdon takes around 2 hours. Alternatively, there are taxis (including a taxi-share service) from the airport to Limoges train station for trains to Gourdon. Toulouse-Blagnac Airport is located 7km from the city centre. There is car hire available at the airport. 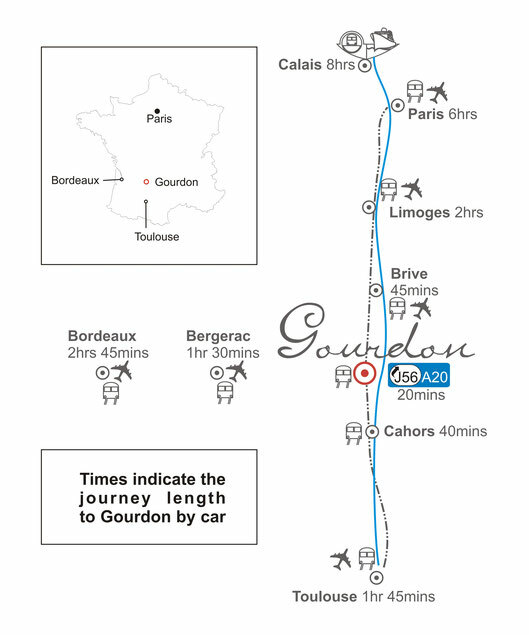 The drive to Gourdon takes around 1 hour 45 minutes: to download a printable PDF giving directions, click here. Alternatively, there is a "navette" (bus) from just in front of the airport to Toulouse Matabiau (the main train station) where there are trains to Gourdon. The bus costs 8 euros, leaves every 20 minutes and the journey time is also 20 minutes (45 minutes in rush hour). French immersion courses in France for adults.